You don’t often get to hear the world premiere of a piece a century old. 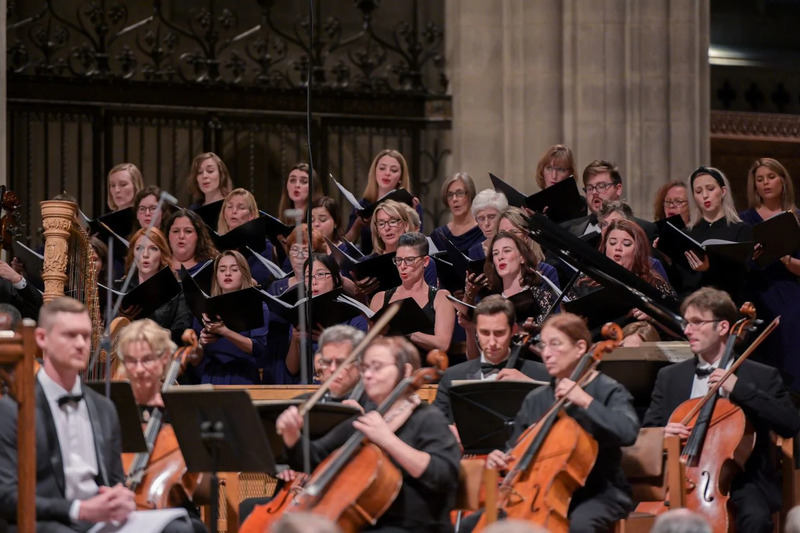 The audience at Washington National Cathedral on Sunday night didn’t quite get to, either; Alexander Kastalsky’s Requiem, called “Commemoration for Fallen Brothers,” had in fact had its first modern performance the week before in Kansas City, Mo., site of the country’s national monument to World War I. And the piece had also been performed and even recorded in different incarnations: the 14-movement version, the version for unaccompanied chorus. But Sunday night saw the D.C. unveiling of its full 17-movement, orchestrated splendor — an event that involved the Cathedral Choral Society and three other choruses, two vocal soloists, the Orchestra of St. Luke’s, and the conductor Leonard Slatkin, very much in charge at the helm. This Requiem is not a masterpiece in the sense that its precursors (like the Verdi Requiem) or its successors (like the Britten War Requiem) are. Like both of these, it is an homage to a particular event; unlike them, it never manages to transcend its program. The concept was to honor all 17 of the countries that fought on the side of the Allies in World War I — Kastalsky had to add movements for the United States, Japan and India in 1917 and 1918 — with a spectrum of musical and liturgical traditions, fused in one giant tapestry. The result is a 75-minute patchwork of folk tunes and languages, bound so strongly together with lyrical choral writing and elegiac orchestra that there’s a sense of sameness, a lack of dramatic variety, to the whole. It’s an undeniably lovely piece, and it must be engaging for the chorus to sing. Kastalsky, born in 1856, was a student of Tchaikovsky and a mentor to Rachmaninoff, and an acknowledged leader, even trailblazer, in Russian Orthodox church music. His choral writing is gorgeous, with much emphasis on effective use of the women’s voices, and a lighter touch than one might expect on the dark male voices that are such a feature of much Orthodox chant. Often, he uses the soloists — here, soprano Anna Dennis and bass-baritone Joseph Charles Beutel — as accent colors to set off or introduce the main body of the chorus. Only rarely did the soloists get their own numbers, like the gentle carol-like “Beati mortui,” in which a Romanian melody smoothed over all differences between the Latin and French texts, as Dennis sang with warm innocence. Such literalism is a feature of the whole piece. The music is simply presented, with little melisma and a steady rhythmic footfall. Its tone is even as well: sweet, nostalgic mournfulness. There are moments of intensity — blaring trumpets (fanfares and Russian military calls) or vocal crescendos — but they almost inevitably modulate into something sweet and gentle. All of the hard edges are blunted and softened, as if the composer couldn’t bear to put more darkness into the world. What he offers is immense sadness and lyrical tribute to the immensity of millions of deaths. It was striking that the performance marked the first official concert of Steven Fox as music director of the Cathedral Choral Society — and he didn’t even conduct. The event was planned well before his appointment. Fox does, however, lead two of the choirs involved, including the New York-based Clarion Choir, with whom he recently recorded the a cappella version of this work. As for the conducting, Slatkin excels at this kind of large, unfamiliar piece: He led it, and played the echoing cathedral, with assurance, supported by the able and resilient orchestra. Yet for all of the massed power, the piece itself remained a gentle, wistful expression of loss and nostalgia, rather than something forceful enough to carve its way into the granite of the 20th century. click this link for original Washington post article.